Amidst community talk and growing citizen concern about the student population of Eastern Illinois University and an increase in crime in Charleston, it is easy to be persuaded to a negative opinion. Yet, I believe it is essential to know just how much Special Olympics Illinois events here in East Central/Area 9 depend on Eastern Illinois University students and faculty support and volunteerism for success, before you base a judgment. East Central/Area 9 provides sports competitions, trainings, and awareness events in 12 counties, including Coles County, where the Area 9 office is located. Most people envision the obvious Spring Games at EIU in early May when they discuss Special Olympics, but EIU participates in Special Olympics events throughout the year, including Special Olympics Family Festival (September), Volleyball (September), Basketball (October-February), the Polar Plunge (February), Young Athletes Programs (fall & spring), and track & field trainings with athletes and coaches (March). Special Olympics needs Eastern Illinois University support, and not just to help run the day-of competitions, but also for their ideas, strengths in areas I lack, and means of outreach. Eastern students and faculty have been pertinent members of the planning committees and have taken on roles as key volunteers for many of the Area 9 events. 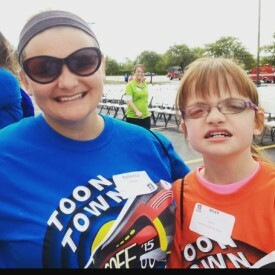 For instance, Dr. Kathlene Shank recruits hundreds of student volunteers, and it can be said that without her, there would not be enough volunteers to run the EIU Spring Games or the Special Olympics Family Festival. In the beginning months of the year, Dr. Shank willingly attends planning meetings for Spring Games, amidst her incredibly busy schedule, and starts recruiting interns, students, and faculty of the Special Education Department to get involved. Faculty members, like Dr. Christy Hoover and Dr. Jennifer Stringfellow, make announcements to their classes and encourage the student body to register as a volunteer for the day. The movement to amass the hundreds of volunteers needed for Area 9 Spring Games requires the faculty members’ precious time, dedication, and persistence, but they all do it so willingly for the love of the Special Olympics athletes. It impresses me every time I think about it. Organizations like the SCEC and Eastern’s Sigma Rho are often highly involved due to the encouragement of Dr. Shank. When hearing Special Olympics, people definitely catch the “special,” but sometimes lose the “Olympics.” We are a sports organization, and therefore I have often utilized the experience and expertise of the Eastern Illinois University Sports and Kinesiology programs, the professors and students alike. Eastern Illinois University coaching greats Dr. Larry Ankenbrand and John McInerny have patiently helped to resolve ruling conflicts, provided support in organizing the sports events, assisted in identifying key volunteers to run those sports and facilitated with training of athletes and coaches at Lanz Fieldhouse. Without fail, year after year, these two gentlemen, their fellow faculty co-workers and the students of the Sports Recreation and Kinesiology programs run the Spring Games track competition and field events. These volunteers just may have the most difficult job at any Special Olympics events, because why get to experience the joy of starting a race, they also have to be responsible and stoic in providing disqualification to athletes that violate sport rules. Long-time Softball Throw Director at Spring Games, Dr. Bill Higelmire, explained best last year when he reported, “I am happy and honored to run the softball throw every year, and although I don’t like having to disqualify, it wouldn’t be a sport without competition and rules.” Hence, Special Olympics leans on EIU Sports, Kinesiology, Athletics and Physical Education programs for support. Eastern Illinois University also hosts the EIU Young Athletes Program, led by Rachel Fisher of Student Activities, which provides integrated sports training and motor skills activities to children in preschool at Mark Twain Elementary in Charleston. Eastern students are the coaches for these Young Athletes, meeting with the preschoolers, both disabled and non-disabled, for eight weeks to teach running, jumping, kicking, batting, coordination and other sports skills. 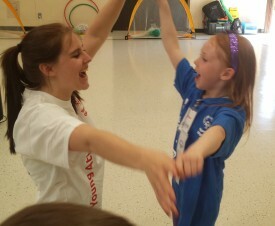 Following the eight week practice period, the Young Athletes Culminating Event takes place. Families are invited to witness and support their preschoolers as they show the skills they have learned from their EIU student coaches. The fact is that the EIU Young Athlete Program truly embodies the meaning of inclusion of all students to learn the possibilities and benefits of sports. 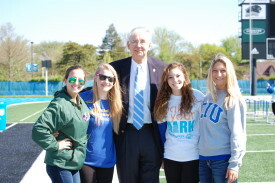 Another EIU group that deserves mention, the Eastern Illinois University sorority Alpha Sigma Alpha, has played major roles in supporting Area 9 events, including the Polar Plunge, Spring Games and SOFF. For the past three years, ASA members have volunteered to work Polar Plunge registration and the Plunge after-party, but have also taken the Polar Plunge, as several of the ASA sisters are pros at Freezin’ for a Reason. This past year, a group of 10 ASA females acted on the first Polar Plunge College Outreach committee this year and we were able to engage teams in the first ever EIU College Cup, providing $500 to the winning EIU team of plungers for most funds raised. In 2014, I approached the group to ask if they would like to be in charge of the Opening Ceremony for Spring Games, and fortunately they were accepting of the challenge. 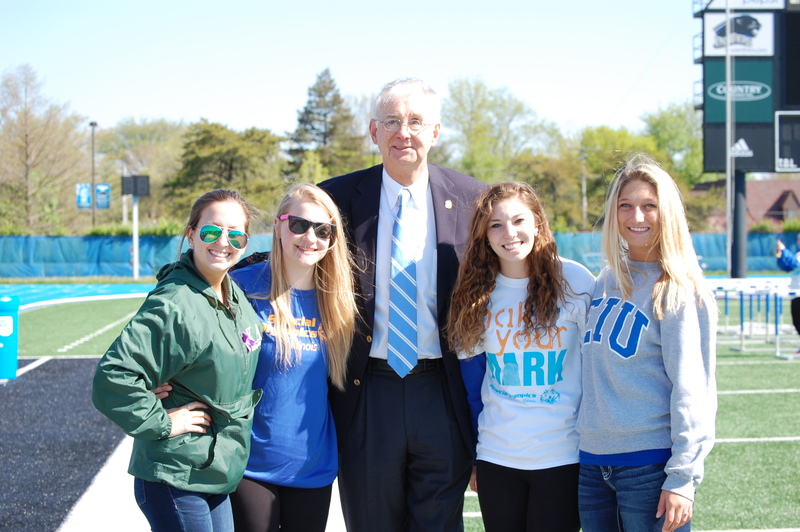 Under the leadership of ASA, the 2014 and 2015 Opening Ceremonies at EIU Spring Games were evaluated to be the most energetic, most organized, smoothly ran, and comprehensive Opening Ceremonies since Spring Games started at EIU in 1979. I look forward to a change in tone and content of community conversation about Eastern Illinois University’s students. Clearly, we need to look deep into the BLUE and see the many great achievements of the EIU student body before making an under-informed opinion. Awareness and news of Eastern Illinois University’s support of Special Olympics Illinois East Central/Area 9 will hopefully shed a positive light and inspire words of EIU’s dedication, commitment and inclusion to the Special Olympics athletes. My eyes see Special Olympics Blue in Eastern Illinois University!